Satisfying the wants and needs of all the stakeholders involved with a new multimodal hub can be as daunting as the actual construction of the facility itself. After years of negotiations, the design of the Multi-Modal Transportation Center at Lehigh Valley International Airport (ABE) finally hit all the right notes for airport officials and the rental car, bus and taxi operators that serve the new facility. With the $5.5 million project complete, residents and visitors in Allentown, PA, are set to benefit for years to come. The new transportation hub has improved the customer experience for ABE passengers in many ways since its substantial completion in August 2017. 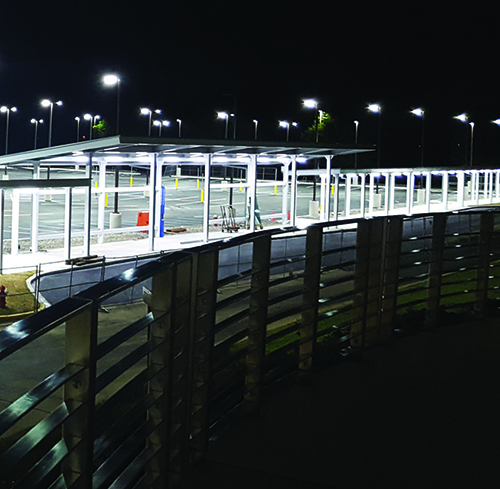 Rental cars are now 700 feet closer to the terminal, covered walkways protect pedestrians from the elements, and safety was improved by eliminating passenger-vehicle conflict points. Surveying & Permitting: McTish-Kunkel & Assoc. Key Benefit: Moving ground transportation operations closer to main terminal to improve customer experience. The new center also doubled the airport’s previous number of taxi stands to a total of 11 and added seven bus slips, with designated areas for the new services. Lehigh and Northampton Transportation Authority buses serve the airport with three local routes, and Trans-Bridge Lines connect airport passengers with Manhattan and New Jersey service. The transportation hub is located on a site that previously housed a building originally constructed as a firehouse in 1965 and later used as a maintenance facility. Because the building was located directly east of the main terminal, it impeded a clear sightline to the rental car operations. The area had grown into a bit of an eyesore, as stray trees and the abandoned firehouse structure were the first things disembarking passengers saw. The new Multi-Modal Transportation Center, however, is much more aesthetically pleasing. Crews cleared away the trees, removed the firehouse and replaced them with covered walkways and canopies. The canopies are constructed of simple structural steel columns and beams, and include glass panels on one side to protect ABE customers from less-than-ideal weather conditions. A new vestibule was added to the existing terminal building near the baggage claim area. Previously, the airport lost a lot of heat whenever passengers opened the door to enter or leave the terminal during Pennsylvania’s cold winters. The vestibule creates a transitional space for waiting passengers and also helps mitigate heat loss and lower energy costs, explains Nicholas Ryan, vice president and Aviation Practice lead of Arora Engineers. 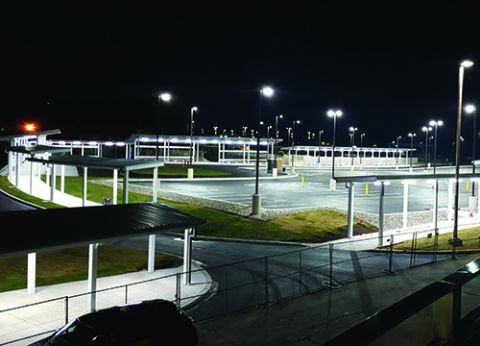 The airport authority funded the project with an existing customer facility charge associated with all rental car contracts, revenue from its passenger facility charge and a $1.75 million grant from the Pennsylvania Department of Transportation (PennDOT). Arora Project Construction Manager Tom Cook was charged with working with the agency. “This included becoming familiar with PennDOT forms and constant communication to PennDOT; so when invoicing happened, the backup would be there and in proper form, per PennDOT’s requirements,” Cook says. Architects from Gensler chose a material palette of steel and glass for the new facility to complement materials used on the existing terminal building. To minimize conflict between automobile traffic and pedestrians on the compressed site during construction, the design team routed the pedestrian path around the perimeter of the bus drop off and parking areas for rental cars. The Lehigh Valley region of Pennsylvania is infamous for troublesome soil conditions that can lead to sinkholes, and the airport was not immune to the problem during its recent project. To address this concern, Arora Engineers devised a plan to excavate an additional 5 feet for the facility’s foundation. This allowed the construction team to lay down even more suitable soil than was called for in the initial plans, explain Ryan. Although the sinkholes and discovery of poor soils led to some schedule delays, the project still reached substantial completion in summer 2017 after breaking ground in December 2016. Arora Engineers also had to address varying grades in the elevation at the jobsite. In order to make the area work with the design plan and meet conservation district permitting requirements, designers made sure the area drained well. The transportation center faced the ultimate test shortly before the ribbon-cutting ceremonies when Allentown was hit with heavy rain. “It was good to see firsthand that the area was draining as designed,” Ryan recalls. Airport Design Consultants, the civil and structural designer of the center, has tackled larger projects than ABE’s Multi-Modal Transportation Center, but its jobs don’t usually require so many different disciplines. In addition to a sizable sitework component, the new center required building, architectural, structural, electrical and mechanical trades.